Children's ride on construction toys are a longtime favorite for outdoor play. They offer younger children the opportunity to be independent and to learn how to do things on their own. 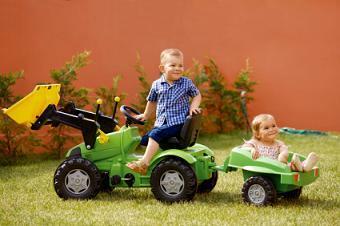 The toys are great for playing in the sand, dirt, or just riding around the yard or park. There are several different types of these toys, as they can range from a simple excavator that is powered by children's feet to a complex tractor that runs on battery power. The complexity of the toy will directly reflect on the price and age restrictions of the ride on toy. Manually operated toys are ones in which children must use their own power to make the toy move. They are just as simple as wooden toy trucks. Sometimes the toy will have pedals to use or children will need to use their feet to make them move. These ride on toys are less expensive in price than ones that are battery powered. They come in a variety of different construction vehicles such as tractors, excavators, and backhoes. Battery-powered ride on toys are more expensive and more complex in nature. They are usually recommended for older children ages 3 and up, whereas manually operated ones are considered safe for children as young as 18 months. These toys need a battery source, usually a 6-volt or 12-volt battery. The child rides on the toy and simply has to press a button or turn a lever to make the toy start moving. There are usually sound effects and movable accessories found on these toys as well. Battery-powered ride on toys are found in a variety of construction equipment such as tractors, backhoes, and front-end loaders. Always follow the manufacturer's guidelines for ages and weights. They are put in place to keep children safe. Never leave a child unattended on a ride on toy. This is especially true for battery-powered toys as a child has the potential to get seriously injured on these toys. Teach children how to ride the toy properly and correct improper use. Improper use of a construction ride on toy can result in harm to a child or someone nearby. Keep all ride on toys far away from stairs, swimming pools, steep hills, and the street. When a child uses a battery-powered ride on toy, the area should be free of any obstacles or potential dangers as some of these toys have the potential for going quite fast. Inspect the toy on a regular basis for any damage, missing parts, or potential safety hazards. While riding battery-powered ride on toys, children should wear a sturdy helmet for protection.